Welcome to Found Off The Street, our look at cars usually found on the cape that rust liked so much it decided to summer there; Cape Cod, MA. Today we have a "found off the cape" 1971 Saab 96. Finding any 40 year old car without rust in New England is rare. Finding a rust free 1971 Saab 96 while cruising the rural country roads of Maine is virtually unheard of. Although it sounds unlikely, that is exactly where we came across this rust free 1971 Saab 96 last weekend. Over its twenty years of production the 96 and the nearly identical station wagon 95 model made Saab famous. The model's quirkiness, high profile rally wins and reputation for safety all contributed to the model's popularity and turned the Swedish car company into a household name. When the model was first introduced in 1960, the 96 had a 38 horsepower three cylinder two stroke engine. By 1971, when this 96 was produced, a four stroke V4 engine had replaced the older two stroke design . The V4 used in the 96 was a more powerful engine originally developed for the German Ford Taunus. Everywhere you look on an old Saab there are quirky design features, from the overall styling to the column mounted shifter and almost everything in between. This particular 96 has the freewheel feature (and it works), a unique option that enables the 96 to coast as if it were in neutral when you are not giving it gas (go here for a more detailed explanation). Even though my knowledge of vintage Saabs is nearly non-existent, I had to stop and take a better look at this 1971 96 when I spotted it right outside the center of a small Maine town. What I found was a two owner car with 102,000 miles on it that didn't appear to need anything more than a headliner. I couldn't remember the last time I had seen any vintage 96, let alone one so nice. Unfortunately the for sale sign didn't have a phone number or a price on it and no one was home. After a thorough inspection I moved on, wondering if I had missed out on a cheap entrance to the weird world of vintage Saabs. After I had made my way back to the cape rust remembered I discovered the car was listed on Craigslist (see the ad here) for $5500. Although I assume this is a fair price for such a nice little car, it is also significantly more than my budget would allow for a vintage Swedish car ownership experiment. 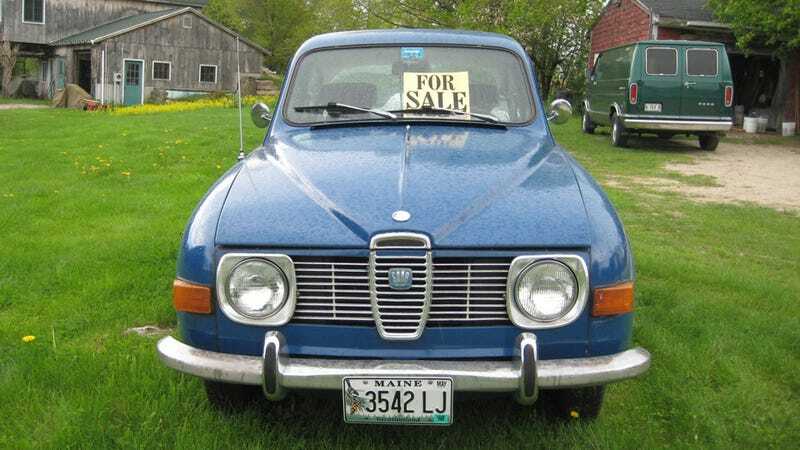 Until the 96 finds a new owner we hope this old Saab will remain where you see it, keeping car spotting in one small Maine town a little bit weird.